Walking through our local London Drugs, a western Canada retail phenomenon of a drugstore that is also a leader in photography, audio-visual and computer sales, i saw an unusual iPhone dock and could not resist slipping my iPhone into it to check out its sound. To my surprise, the iPhone responded by a notification popping up to inform me that the iPhone requires an app from the App Store and asking if I would like to download it. This is not your father’s clock radio; in fact, it isn’t a radio at all. Welcome to a hint of what the future has to offer in this social networking iphone alarm dock. The iA5 by iHome Audio is simple in its design looking like a stylized black box with an industrial grating front like an Apple Keynote slide theme. When you dock your iPhone for the first time and enter the settings screen on the iHome + Sleep app, one option is to have the iA5 set to the time on your iPhone; well, that’s easy. Other options include allowing it to find your location (or manually setting one) for the weather information that it keeps up to date. You also enter your Facebook and Twitter usernames and passwords for the social side of this device. Socialized sleeping? Another option that you can program is whether you want to post a tweet on Twitter or a Facebook status update upon awakening or sleeping. 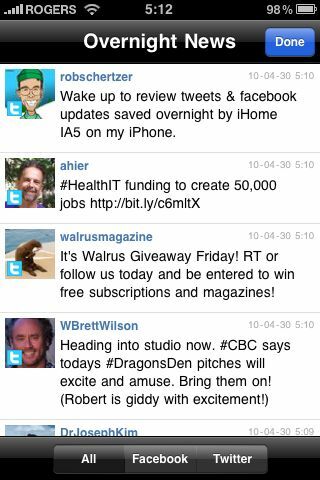 You can create a bunch of different tweets and updates and will be prompted when setting the app at bedtime and when you wake up in the morning, to choose which one to send. In addition to keeping track of the local weather, your overnight Twitter and Facebook news, and allowing you to sleep and awake to your choice of the iPhone’s iPod selections, the iHome + Sleep app also tracks your sleeping pattern in terms of how many times you hit the Snooze bar, hours of sleep, Bedtime, Wakeup time, favourite album to fall to sleep to and wakeup to. The sleep information details most recent, average this week, average this month and average this year. Overall I’ve been very happy with the iA5 and would recommend it if you are looking for a bedside dock for your iPhone or iPod touch. It is great how it doesn’t take up much space and the sound is quite good. The fact that it is monophonic is not an issue since you are lying in bed with only one side of you facing the speaker. Without an iPhone or iPod touch the device is fairly limited. There are some manual controls so you can adjust the time and built-in alarm but this device is really meant to be controlled by the iHome + Sleep app.